Q. Do you offer custom products? Yes, we do, for over 50 years. Contact us directly at 1-800-523-5155 to discuss your proposed project. 100% satisfaction guaranteed. References are available upon request, as well as examples of some of our work are located on our Custom Designs page. We will guide you through size, plating and design questions to fine tune your vision for your custom design. Once the details have been decided we will prepare a custom design proposal for your review and signature. A 50% deposit is required with the signed proposal. We will prepare artwork based on the initial consultation within 36 hours. Only when you are 100% satisfied with the artwork do we proceed to production. Production takes between 30-45 days depending on the scope and design of the project. Q. Do you sell in bulk or wholesale? Get Started Here: fill out our wholesale form and forward two trade references to sales@terrasanctaguild.com. Initial Order: Your initial order minimum is $100.00 thereafter there is no minimum order. First time orders are pre-paid with a credit card. Discounts: 40% discount on published retail pricing when ordering the prior fiscal year is less than $750 net wholesale. 50% discount when prior years sales are over $750 net wholesale or if a single order exceeding $250 net wholesale is placed. All CH items and golfs balls are a 40% discount at all times except for sale periods. Candles are not discounted. Drop Shipments: We provide drop shipment services. The drop ship fee for orders 0 - $100 is $3.00. Over $100 the fee is $5.00. If you carry over 100 of items on your website all drop fees are waived. Returns: Damaged or incorrectly shipped merchandise is returnable with authorization. A 15% restocking fee will be applied on all other authorized returns. Office Hours: 10-6PM Monday – Friday. We respond to all inquiries 24/7 using our email sales@terrasanctaguild.com. Website Ordering: You can place your orders online by creating an account and then using DLR40 (40% Discount) or DLR50 (50% Discount) to complete the order. The discount levels are defined above. Free Floor Display: We offer a free 5’ floor display spinner which is highlighted on page 59 of our catalog. This display when fully stocked costs roughly $800.00-$900.00 wholesale. The display has convenient storage in the bottom and can display your store graphics at the top if requested. We also offer a 3’ counter top spinner which holds approximately $400.00 of wholesale product. We offer 90 day terms on our displays and swap outs at any time. For more details on this program please see page 59 of our catalog. 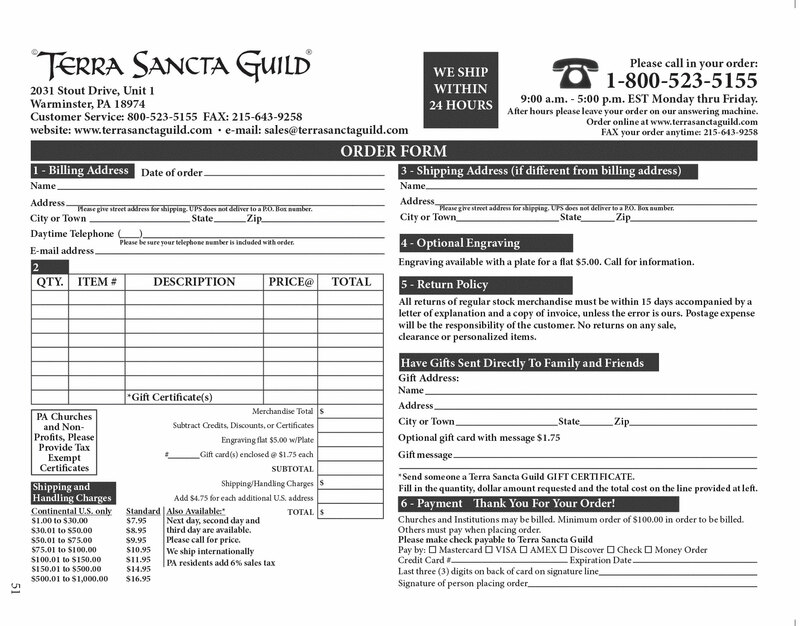 All returns must first receive authorization from Terra Sancta Guild within 30 days of the purchase date. Buyer is responsible for shipping the returned item(s) at buyers expense including any insurance. Buyer will receive a 100% refund on purchased merchandise only within 5 days of receipt. No returns are accepted beyond 30 days from purchase date. Any item(s) that has/have been personalized (engraved) is a final sale and non-returnable and non-refundable. All returned Items must be in new condition, unused and in its original packing including ALL original parts, original box, tags, and packing materials. Terra Sancta Guild will not issue a refund or exchange if our merchandise inspection reveals that the item has been used, damaged, or altered. Terra Sancta Guild recommends you use a shipping method with proof of delivery as well as fully insure the returned merchandise for your protection. Refunds are processed within five business days of our receipt of the returned merchandise. Q. I need rush engraving. Can you do that? Yes, we offer same day engraving as long as your order is received prior to 12:00PM that day. More information can be found on our Same Day Engraving page. We provide a font catalog to help you select engraving font options. We ask that you double check all engraving prior to placing the order. We do not refund customized orders unless it is our error. Q. Do you offer a catalog of your products? Yes, both online and print! All prices shown below are for Continental US orders only. We normally ship by USPS or Federal Express Ground. Overnight Shipping is available for M-F deliveries only. Please contact us for pricing on overnight and overnight Saturday deliveries. Please email us at sales@terrasanctaguild.com or call 1-800-523-5155. Q. Do you offer International Orders online? We do not offer international ordering from our online store; however, we will be happy to take your order via phone at 1-800-523-5155 or you can email us at sales@terrasanctaguild.com.